Washington, DC, November 18, 2014 – As an extension of their award-winning National Adoption campaign, the U.S. Department of Health and Human Services, AdoptUSKids and the Ad Council are unveiling a new series of public service advertisements (PSAs) today designed to continue to encourage the adoption of children from foster care with an emphasis on the importance of keeping siblings together. Since the launch of the campaign in 2004, more than 22,000 children who were once photo-listed on the AdoptUSKids website are now with their adoptive families and over 35,000 families have registered to adopt through AdoptUSKids. The new PSAs will be unveiled today by JooYeun Chang, Associate Commissioner of the Children’s Bureau, at an event to celebrate the 10th anniversary of the National Adoption Campaign and recognize accomplishments in achieving permanency for children and youth in foster care through the U.S. Department of Health and Human Services’ Adoption Excellence Awards. Created pro bono by advertising agency Kirshenbaum Bond Senecal + Partners (kbs+), and Hinge Digital, the new English and Spanish television, radio, print, outdoor and digital PSAs conclude with the well-known tagline: “You don’t have to be perfect to be a perfect parent.” The PSAs feature parents participating in activities with their children such as a father trying to build a tree house without carpentry skills, a mom roller blading with her sons even though she is not a skilled skater and a mom and dad accidentally burning their daughter’s favorite breakfast. The objective is to reassure potential parents that all kinds of people have the potential to make a positive impact on a child’s life. 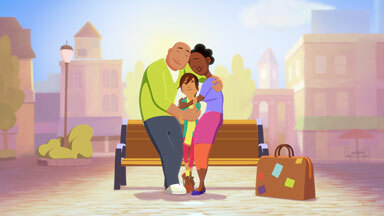 All of the PSAs direct audiences to visit AdoptUSKids.org or to call 1-888-200-4005 (English) or 1-877-236-7831 (Spanish) to receive the latest information about the foster care system and the adoption process. “This campaign has one of the hardest asks in a PSA and the results in the last ten years have been truly extraordinary,” said Lisa Sherman, president and CEO of the Ad Council. “Thousands of parents have welcomed children into their homes, their families and their hearts. By reminding parents that they don’t have to be perfect to make a lifelong difference in somebody’s life, we look forward to continuing to see the transformative impact of this campaign on families throughout the country. The Ad Council will distribute the new PSAs to media outlets nationwide this week. Per the Ad Council’s model, the PSAs will run in time and space donated by the media. Since its initial launch in 2004, the campaign has received more than $430 million in donated media support across television, radio, print, outdoor and digital media. For more information about adoption, or about becoming an adoptive parent to a child from foster care, please visit www.AdoptUSKids.org or visit the campaign’s communities on Facebook and Twitter. Within the Department of Health and Human Services (HHS), the Administration for Children and Families (ACF) is the agency that is responsible for federal programs that promote the economic and social well-being of families, children, individuals, and communities. The Administration on Children, Youth and Families (ACYF) administers national programs for children and youth; works with states, Tribes, and local communities to develop services that support and strengthen family life; seeks joint ventures with the private sector to enhance the lives of children and their families; and provides information and other assistance to parents. Many of the programs administered by ACYF focus on children from low-income families; abused and neglected children; children and youth in need of foster care, independent living, adoption or other child welfare services; preschool children; children with disabilities; runaway and homeless youth; and children from Native American and migrant families. For more information on ACF’s adoption programs, please visit http://www.acf.hhs.gov/programs/cb/focus-areas/adoption. AdoptUSKids is a multi-faceted, federally funded project whose mission is to raise public awareness about the need for families for children in foster care, and assist States, Territories and Tribes to recruit and retain foster and adoptive families and connect them with children. The project is managed through a cooperative agreement with the Children’s Bureau at ACF. KBS (kirshenbaum bond senecal + partners) is the brand agency for an inventive world. We are an integrated creative, advertising and marketing agency committed to inventing the highest value ideas for our clients and for ourselves. Our team of passionate inventors and creative entrepreneurs is dedicated to doing things that matter and making things that matter. Today KBS serves a diverse roster of clients that includes American Express, BMW, Harman, HomeGoods, Simmons Bedding Company, William Grant & Sons, Boar’s Head, TE Connectivity and Vanguard. For more information on KBS a member of the MDC Partners Network, please visit www.kbsp.com or follow us @kbsp_agency. Hinge Digital (Hinge) is an integrated creative production studio and digital agency, specializing in dynamic visuals for broadcast, film, out-of-home, digital and print. Our work spans from strategy and concept development through live action production, animation and post-production visual effects. Our team of passionate and experienced storytellers is dedicated to bringing your ideas to life. Hinge serves a diverse roster of clients that includes adidas, Intel, UPS Store, Dunkin’ Donuts, Microsoft, Merck, Nike, UPMC, NVIDIA, and EA. For more information on Hinge, please visit http://www.hellohinge.com or follow us @hingedigital. The Ad Council is a private, non-profit organization with a rich history of marshalling volunteer talent from the advertising and media industries to deliver critical messages to the American public. Having produced literally thousands of PSA campaigns addressing the most pressing social issues of the day, the Ad Council has affected, and continues to affect, tremendous positive change by raising awareness, inspiring action and saving lives. To learn more about the Ad Council and its campaigns, visit http://www.adcouncil.org/, like us on Facebook, follow us on Twitter or view our PSAs on YouTube. Previous PostAdoptUSKids PSA featured on NBC4 in Washington, D.C.